Forty days after the Nativity the Holy Family came to Jerusalem so that Mary might be puriﬁed in accordance with the Law, and the Child might be presented in the Temple. The blue/mauve altar in the painting above is placed in a rather odd triangular structure that looks out onto somber green hills. One broad arch spans three ﬁgures and a wall rises beyond the frame, apparently to a great height. The ﬁgures themselves are monumental. the aged prophetess Anna, who holds a long beeswax candle (read her story at Anna, prophetess. Other ﬁgures who usually appear—Joseph, a female attendant with the sacriﬁcial doves, and the High Priest—are not included. 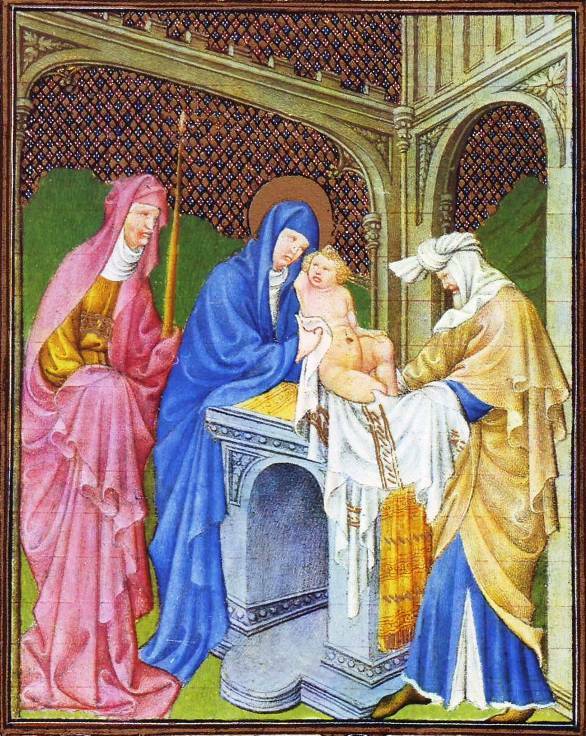 Simeon, his hands covered by the white and gold cloth, prepares to take the Child from his mother. In doing so he parts the legs in a manner that suggests the related scene of the circumcision. Jesus, the same robust child we have seen in the Nativity and Adoration of the Wise Men, seems understandably reluctant to go to the old man and clings to his mother’s neck – a homely touch painted by a man who obviously knew what real babies were like. Simeon hails Christ as ”a light to lighten the Gentiles” and the taper held by the devout old Anna is a reminder that candles were blessed and carried in procession as part of the ritual of the feast of February 2nd, popularly known as Candlemas. This miniature painting differs in style from the preceding ones of Mary in the Book of Hours, and it was probably painted later. The surfaces are more luminous, and the draperies show more lively curvatures than in any other of the paintings. Anna and Simeon are also unusually attenuated. The colors are wonderful, ranging from a soft tan, mustard, violet and rose to a subtly graded white and a superb clear blue.